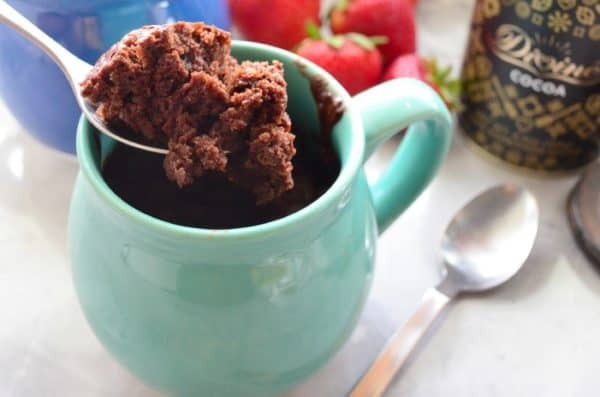 Satisfy your sweet tooth in less than 5 minutes time with my irresistible and easy-to-make individual serving of a Dairy Free Chocolate Mug Cake. I’ve always had a sweet tooth since as long as I can remember. I’m pretty sure it’s something your born with. Then when I was pregnant with my daughter last year my sweet tooth kicked into high gear! I ate sweets, specifically chocolate at just about every meal. Chocolate mug cakes have been my thing for almost a year now. It’s an easy way to enjoy cake but in a single serving setting and with minimal prep and cook time. It took me a good 6 months to perfect my chocolate mug cake game. Specifically, trying to make this mug cake dairy free. In my head, I feel like it’s a little healthier when you omit the butter and cream. I know what your thinking–this girl is crazy it’s still cake and it’s full of sugar and non-dairy creamer. I totally realize it’s not the healthiest of desserts (but I’ll still let myself think it’s a little healthier then the dairy filled version). The best part about my dairy free chocolate mug cake is that I always have all the ingredients on hand. I’ve also made this recipe enough that I have memorized the measurements. Now, for a cook this is a big deal because cooks typically don’t measure much. It’s a little bit of this and a little bit of that. As we all know, when you bake you have to measure or else your end result might come out pretty scary and taste like garbage. 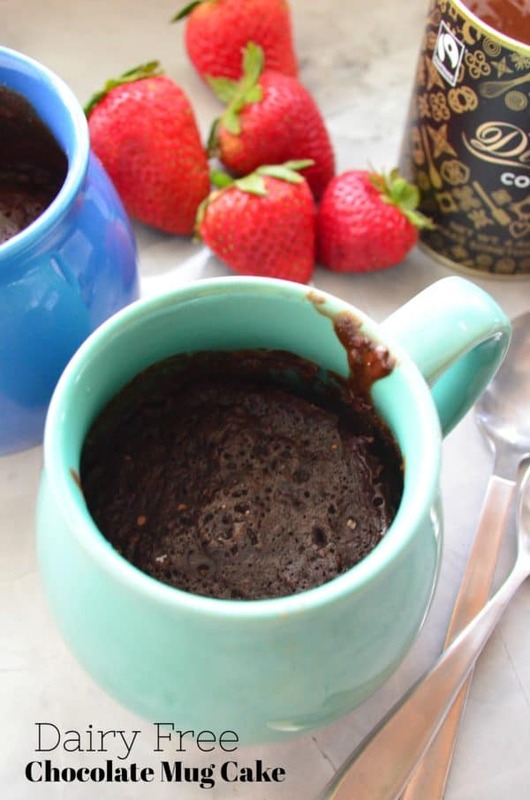 I love to add fresh strawberries to this mug cake to balance out the intense chocolate flavor. 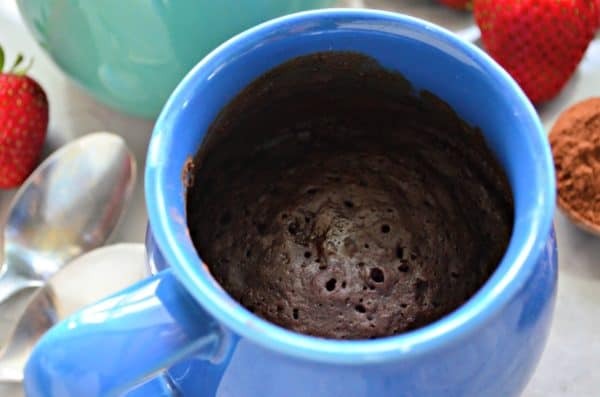 This really should be named dark chocolate mug cake because you aren’t getting that creamy milk chocolate flavor that you would get on a chocolate lava cake per say. I’ve entertained with this chocolate mug cake recipe on multiple occasions. If we had friends coming over unexpectedly for dinner and I wanted to wow them with a little dessert. I would whip these up for them. Instead of cooking in a coffee mug I cook them in little ramekins that make them look like little cakes. You can carefully remove the chocolate cake from the ramekin and plate with fresh strawberries or you can serve as is with a little strawberries on top. Of course, if you don’t own little ramekins you can always serve your guest the cake in a mug. Once they have their first bite they will forget they are eating out of a coffee mug. Pro tip: cook for only 45 seconds and you’ll get the results of a lava cake with a soft center! Since their are no eggs in this recipe it’s okay to eat this not fully cooked through. So if your craving something sweet and want a little bit of cake instead of buying a whole cake from the store. 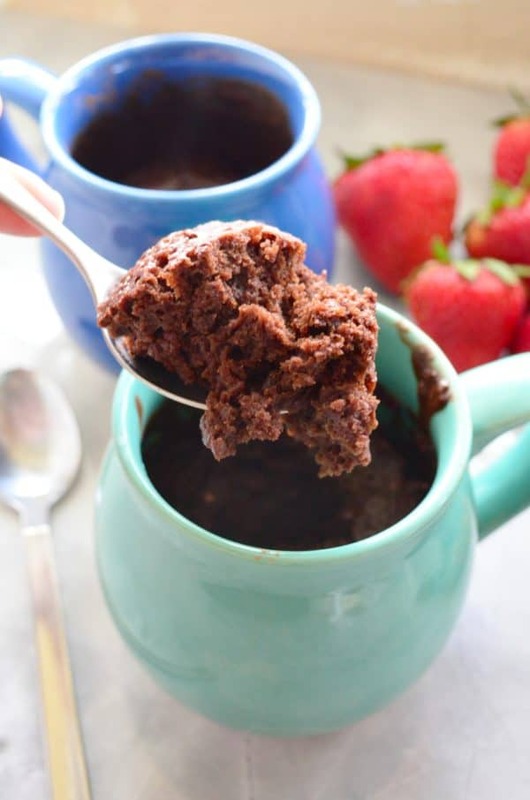 I invite you to try your hand at my dairy free chocolate mug cake. Combine all the ingredients in a 10 oz. microwave resistant mug. Mix until smooth and microwave for 1 minute at 1,000 watts. Let cool for 1-2 minutes, top with freshly sliced strawberries, and enjoy. Cook for only 45 seconds and you'll get the results of a lava cake with a soft center! Since their are no eggs in this recipe it's okay to eat this not fully cooked through. If you are cooking more than one cake, microwave each cake individually. Recipe has not been tested with dairy. Dark Chocolate Mocha Fondue for Two!